Biography: Having appeared in some two hundred and fifty-five films and televisions productions, Lee has the distinction of being listed in The Guinness Book of Movie Facts and Feats as the international star with the most screen credits. Numbered among those credits are the sinister roles which Lee created for Hammer, the British production company which in the 1950s revived the public's fascination with 'horror movies. In playing both Frankenstein's 'Creature' and Dracula, Lee became the successor to 30s movie leends Boris Karloff and Bela Lugosi. Although best-known for his horror roles - Christopher Lee also portrayed Rasputin, Fu Manchu and the Mummy - he has played a diversity of roles in many languages (among them English, Russian, rench and Italian): he was Conan Doyle's faamous detective in the German-made picture, Sherlock Holmes and the Deadly Necklace, and later played Holmes' brother, Mycroft, in Billy Wilder's The Private Life of Sherlock Holmes. Among Lee's 'rogues gallery' are the Marquis St Evremonde in A Tale of TWo Cities and Rochefort in the 70s production of The Three (and Four) Musketeers. He was also Lord Summerisle, the leader of the pagan cult, in The Wicker Man; Dr Catheter, the medical genius behind the Splice of Life laboratory responsible for the 'new batch' of nasties let loose in Gremlins II; and the evil Francisco Scaramanga, James Bond's title-opponent in The Man with the Goldun Gun. 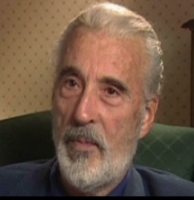 Christopher Lee continues to demonstrate his extraordinary versatility in the film roles that rane from his inter-galactic apppearance as Count Dooku /Darth Tyranus in Star Wars: Episode II to his portrayal of Mohammed Ali Jinnah, the founder of modern Pakistan, in the 1998 film Jinnah.  (on Tolkien) "The greatest inventor of language and legend in my lifetime."